Did you know that an estimated 31 million Americans experience back pain? According to the Global Burden of Disease, back pain is the single leading cause of disability. Back pain is also one of the most common reasons for missed work resulting in a staggering $50 billion each year spent by Americans to treat the pain. Check out the below infographic on more alarming back pain statistics courtesy of TheGoodBody.com. Back pain is a common problem, but it doesn’t have to be a common part of everyday living. There are safe alternative treatment options available that focus on treating the root cause of your chronic or acute back pain versus medication. 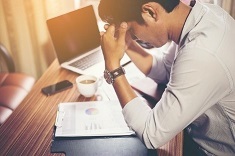 Many Americans suffer from moderate to high stress. Whether its money, work, family responsibilities, or health concerns, if stress is left untreated, it can become chronic. And chronic stress can lead to all sorts of long-term health issues. According to the American Psychological Association (APA), chronic stress is linked to the six leading causes of death: Heart diseases Cancer Lung ailments Accidents Cirrhosis of the liver Suicide Moreover, 75% of all physician visits are stress related. So, how do you eliminate stress? Before I share some tips on how you can best mitigate and overcome stress, I would like to point out a few things you shouldn’t do when trying.